Intrigued with the creative potential and the physical challenges of making pottery, I started my career in pottery with intensive workshops, including a four-year apprenticeship. I found expert direction, inspiration, and an enduring love for the process of making pots in these workshops. Over the course of my four summers as a student at Pond Farm, Bauhaus master potter, Marguerite Wildenhain, taught me and her small group of students the process of making pottery, and she showed us how to begin to think and live as artists. As a teacher, Marguerite drew upon on her own Bauhaus learning experiences, her additional European training, and 50 years rich with the experience of producing beautiful, expressive pottery and teaching pottery-making in the summers. I worked on a kick wheel through those four years of my apprenticeship, which was fundamental to my education as a throwing potter: the simplicity and rigor of the kick wheel teaches one the how to feel the appropriate speed for each operation of the throwing process. I used the kick wheel in my studio for another two years, then transferred to an electric wheel. My electric wheel offered a speed controller with the close feel of a kick wheel and it increased my productivity, making it possible to earn a decent living in the 20th and 21st centuries. I finished my apprenticeship in 1979, and I began participating in juried arts and craft fairs in Oregon, California, Washington, Arizona, and Nevada. My wife and I enjoyed the travel and soon had an annual route doing eight to ten fairs a year, along with some wholesale accounts at a few select galleries. We enjoyed consistent success with fairs for over 25 years and still have standing invitations to return to many as a “Hall of Fame” exhibitor. Nimbus, in our hometown of Ashland, Oregon, was our first gallery and currently maintains a large display of our pottery, along with two other Oregon galleries. During this time, we opened our first store location in Ashland, which became home to our pottery and the fine arts and crafts of several friends whose work we much admired while traveling the fair circuits. The store moved to three different locations in Ashland and grew progressively larger in floorspace with each move over the next sixteen years. In 2010, we closed our downtown gallery and moved our pottery to the internet and to four Oregon galleries. With the help of my former apprentice, Jon Winter, I rebuilt my Olsen 24 kiln that had been in use for 35 years and had over 1000 firings and more than 140 tons of clay pass through it. 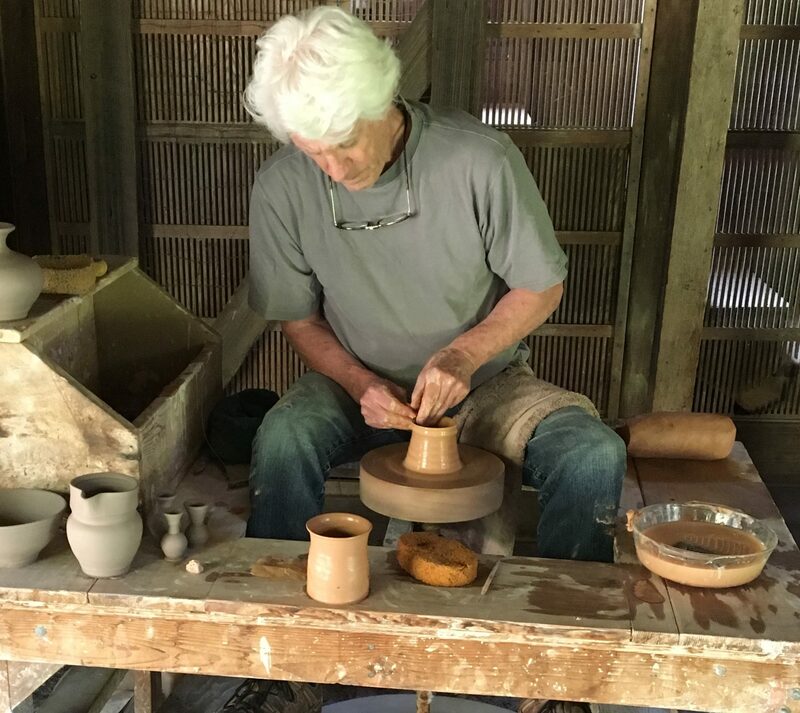 It is revitalizing to return to one’s roots and rebuild with almost four decades of pottery-making experience! It would be nice to have another 38 years to see if I could wear the kiln out again! Several years ago I started doing two-day seminars featuring demonstrations, presentations, and conversations about living and working as a potter. It is something I find very enjoyable and I am always looking for teaching opportunities of this sort. Contact me if you are interested in discussing a workshop! I continue to make pots daily and feel more excitement for the process than ever: it is all so very interesting, and there still is much to learn. Making pottery as a skilled craftsman in the 21st century is not an easy path to take, but I continue to draw enduring strength and inspiration from Marguerite’s expressive and imaginative pottery, her wonderful teaching methods, her humanity, and her personal dedication to the making and teaching of pottery. For more than 40 years, now, I’ve enjoyed creating this deep well of experience. I revel in the support of my family, friends, and the many customers who take delight in the pots I am able to make. Thank you for your continued interest in my development as a potter and my pottery. I always strive to improve and understand as much as I am capable of absorbing. There really is no limit to the study of a this interesting subject of pottery.